I wanted to start creating Bat Reps for my armies. Hopefully I can start turning this thread to a video blog giving video bat reps but this will do for now. First off a bit of fluff about this army and Leena Lunders! Leena Lunders was born to a modest family in the west of Mootland near the border of Sylvania. Her and her older brother Bard would often venture into the woods of Sylvania as children. They would build camp fires and tell ghost stories. Leena grew up like most of the other children in her village, her family was far from wealthy but made a simple living. Leena's father Phinehas was the owner of a small potion and tonic store in the village. As Leena grew up she learned quickly that it would be hard to make something of herself in the village of Ginglemoot. Women in this villiage were mostly looked over, they were more bred to be wives then adventurers or business owners. Leena decided she wanted more out of life, she wanted to be a business owner like her father and his father before him. She decided, with her father's guidance, to leave for schooling at the Magic Colleges in Altdorf. She prepared to become a potion master as her ancestors were. Fate had different plans for the young Leena Lunders of Ginglemoot. Leena took to potion making as a Griffon takes to flying. She amazed the professors that were attending her. She even met the Patriarch of Potionmaking and received an award for a potion of foolhardiness for Riekmarshal Kurt Helborg. He personally said "It worked very well." praise like this worked wonders for the small town girl. She began working on a new project, a potion of light. This potion would raise up courage in all those around the owner. While she was working on this new potion type she fell in love with the idea of Light Magic. Right away she convinced her professors to let her explore the Light College. She loved it. Never before had she seen such beauty. It was so different from the dismal world she was used to so near Sylvania. The only next logical step for Leena was to join the Light College. She joined immediately. She was only 15 at this point so it was not too much of a problem for the professors to bring her up to speed. Her natural skill brought her to a Battle Wizard within the first year. At the age of 16 she was released into her first battle. She gained experience and grew her natural flare. She quickly found herself as a Battle Wizard Lord. There were many great stories and heroic feats along the way but she got there. Once she was awarded the top honours for a battle wizard Leena decided it was time to start the business she had always wanted. Even with the protest of the Light Patriarch she would not be swayed. She left the Colleges to return to Mootland and to Ginglemoot. Leena came home to find Ginglemoot very different then when she had left. There was a great shadow to the north. It looked like the sun had not shon for months, even years. The crops were grey and the people's faces pale. She thought some even resembled the ghost stories they had told as children. When they finally arrived in Ginglemoot she was able to find her father easily enough. She found out that her brother Bard had left to join the Stirland Swordsmen Company. Leena worked hard in the family business to grow a good life for her in Ginglemoot. This life soon be interrupted however. It turned out that the darkness in the north was very unnatural. Something was stirring in that darkness and it would not be at peace much longer. Before long Leena would be called to battle once more. Not just for the Empire or her training but for her family, friends and the very place she called home. The darkness loomed but she was defiant, she would show these villagers hope, strength and the light of Sigmar! 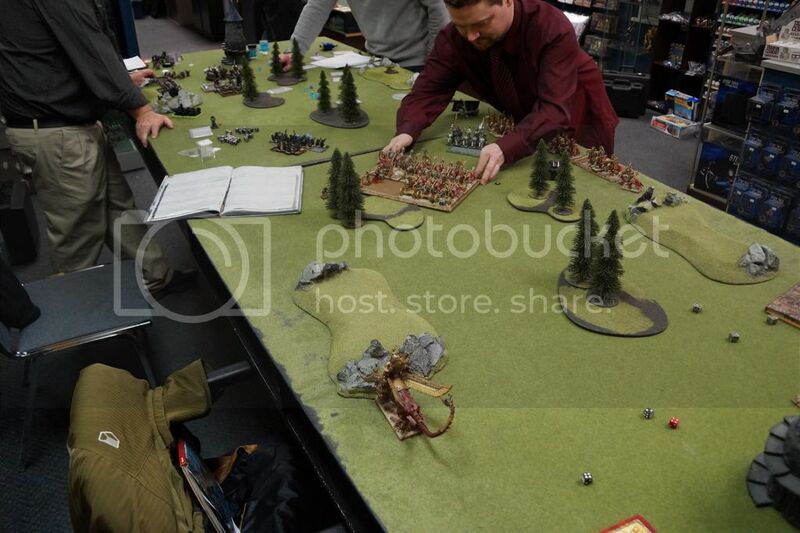 So last night brought the list to my LGS League Night and had a game. 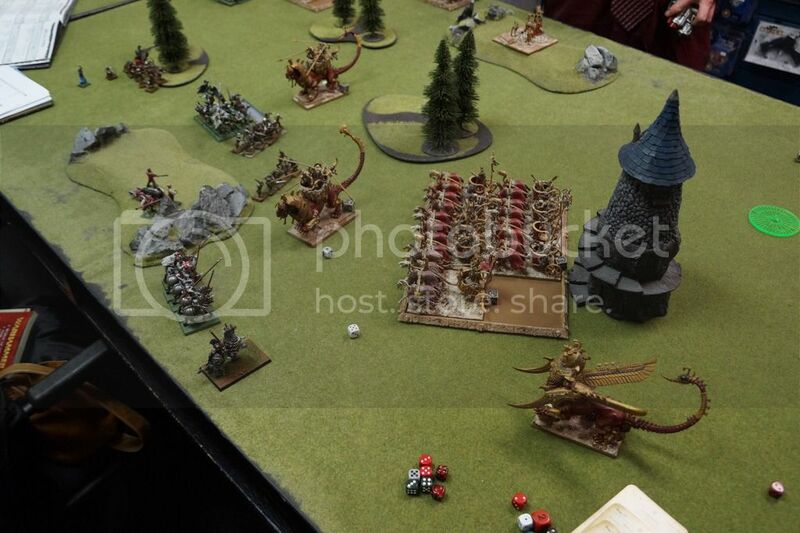 It was awesome that the other player brought Arkhan the black and a mix of Vampire Counts and Tomb Kings. Very thematic for my list. 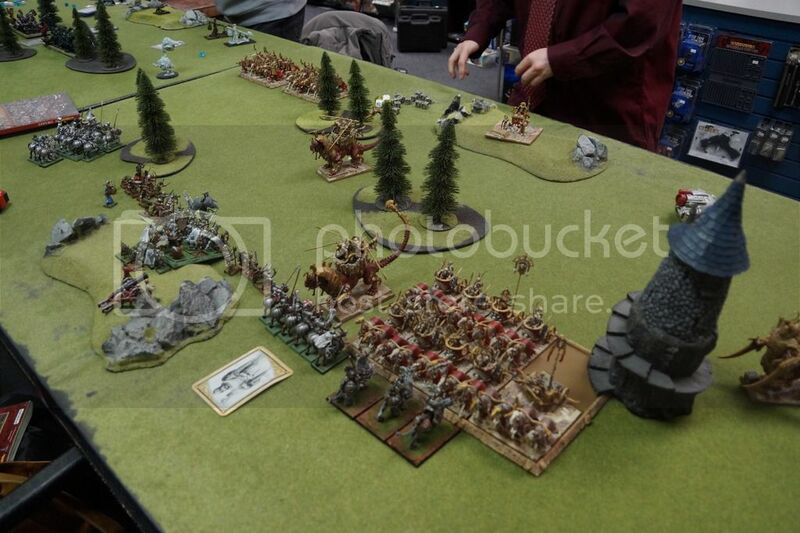 The other side was pretty much Skele Archers(50), Zombies(50), Arkhan the Black, Casket of Souls and a Catapult. Then there was Etheral stuff; 4 Spirit Hosts(I think?) 5 Hexwraiths 5 dogs. There was also some Necromancers. I deployed heavy on my left with my large block of knights and GS both over there. Cannon and Wizards and Witch Hunter in the Middle. Demigryphs took the right with 5 Vanilla Knights. 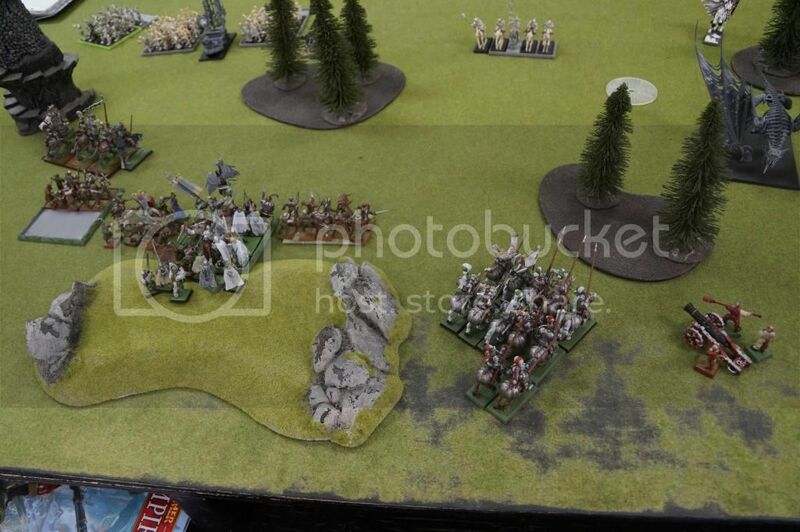 He deployed archers in the middle, Casket and Catapult behind them. 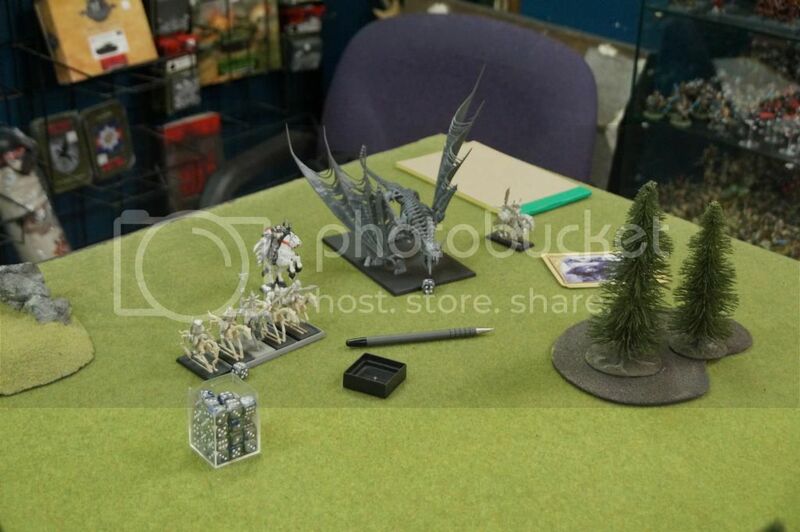 Arkon on the right with Hexwraiths and zombies on the left. The cannon got one chance to shoot but missed and took a beating on his first turn. The wizards tried for Banishment on Arkon but it was dispelled. I felt like I had him out ranged so I held almost everything back. Other than destroying my cannon his first two turns were relatively quiet. We traded scrolls in the second turn, him dispelling banishment and me dispelling Arkon raising things. He did come and meet my vanilla knights with a spirit host and held them up. He blocked my demis up with a spirit host and in turn 4 they ran off the board after also being charged by the Hex Wraiths. With my whole right flank crumbling I started to make some progress on the left. I got Timewarp on my GS and they came up to meet the zombies with a group of Militia. My Inner Circle Knights tried to cross the field to charge the archers and were held by a spirit host. His archers took out my wizard bunker. I managed to get off banishment twice against Arkon but he still lived with 1 wound left. At the bottom of the fourth he raised some Sepulcral Stalkers. These misfired 4 times and killed themselves in the bottom of the fifth. 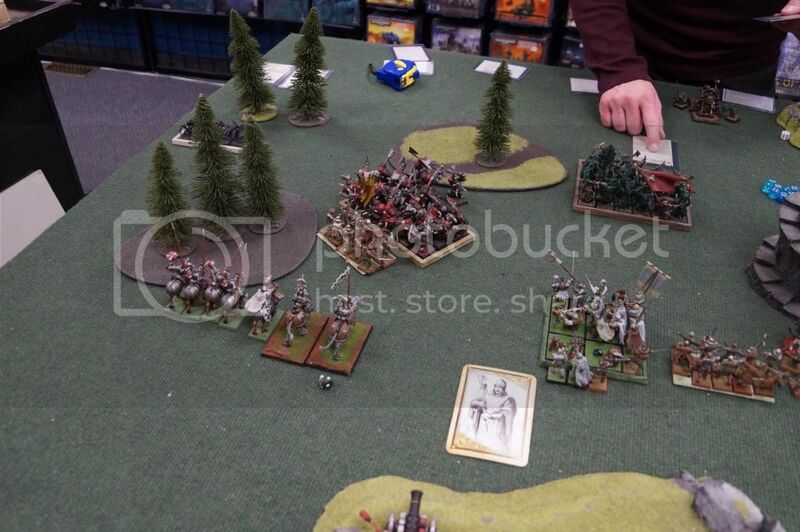 The GS killed the last zombie and repositioned to take on the skeletons archers with his wizards. My lvl 4 Wizard managed to take out Arkon finally! Also in round 4 and 5 that wizard survived 2 IF (once survived being sucked into the void) and made 9 ward saves. 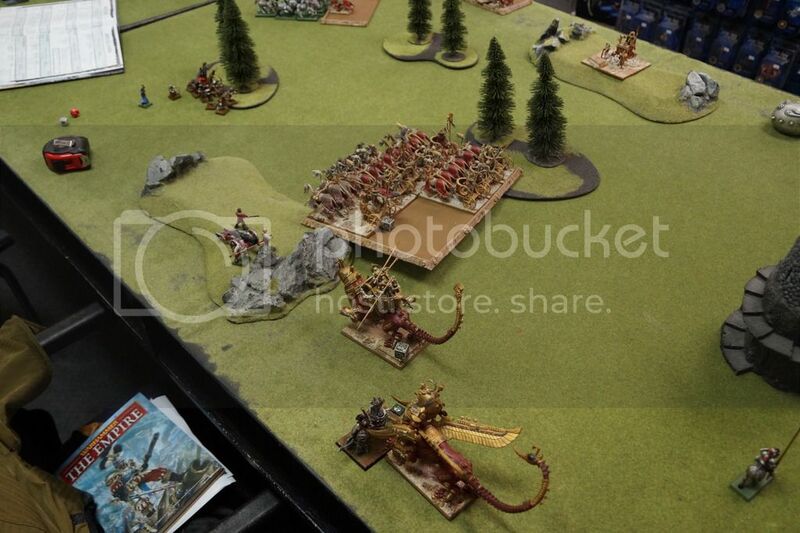 In turn 6 after Arkon was defeated she threw one more banishment at the Hexwraiths and they were slaughtered. His lvl 4 wizard at the bottom of 6 made a cross table shot and finally killed her though. The ICK finally killed the spirit host that was holding them up but it was too late to really join the fight. The game ended in a draw. I felt that 2 major things hurt me in the game. 1 was not having much of anything to deal with Ethereal Creatures and 2 was my inexperienced Deployment. I really pinched in my ICK having them on the left flank. I felt like the FCM did their job well as one detachment was used as a wizard bunker when the archers died and the other charged in with the GS clearing out more then their weight in Zombies. I think that the lvl 4 Wizard has really become my hero and she will have a name from now on. Without her it would have definitely been a loss. Overall great opponent, great themed game and a great battle with a lot of surprises and twists and turns! Really nice! I enjoyed it, and hope to read more. Picture/drawing or something for our character would be great. Spirit hosts are the bane of my existence as well. I'd recommend taking Shem's burning gaze and throwing that or banishment at them every turn, just to clear them up. I think it's worth it in the long run, as they can tie up units too effectively. The old wisdom born out of the west was forsaken. Kings made tombs more splendid than the houses of the living, and counted the old names of their descent dearer than the names of their sons. Childless lords sat in aged halls musing on heraldry, or in high cold towers asking questions of the stars. Leena Lunders awoke to sounds coming from outside her tent. The camp must be under attack! But where was she? She was so confused. Her memory faded into view. She was on a short campaign against the Orcs and Goblins. It had been a long time since she had last seen the college of light where she was studying. She wanted some field experience so she joined up with Brother Fullster. Fullster is a hard man, but a good one. Often leading the charge in the toughest parts of the field, he would lead on and would seem everywhere. Sometimes with the Demigryphs and sometimes with large or small units of knights. He would always show up where needed, when needed. Fullster had been put in charge of a sizeable force out of Wissenland. They were ordered to do a short patrol along the southmost border of the black mountains. Leena joined in, it was her first campaign, she had never used her powers outside of the college. Now all too quickly she came to the realization that it was time. As she left the tent she could feel the cold rain beating against her face. She could hear the treacherous cries of orks in the distance. It was time to take positions. Greatswords take the middle of the field with detachment of militia on both sides. 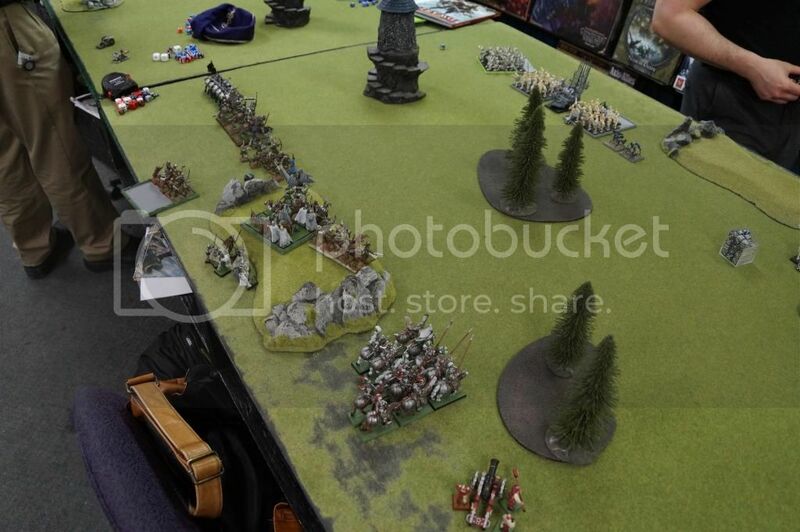 Leena Lunders and lvl 4 Light Wizard sit in wizard bunker behind the right detachment of FCM while the cannon sits in the left militia detachment and Brother Fullster joined the Demigryphs. the Orks put their spiders on the far flanks, Grimgore with the Black Orks, both shamans with the Savages. He put his artillery behing his lines. the Orks had 2 Doom Divers, 2 Rock Lobbas, about 40 black orks, 40 Savage orks, 2x5 Spider riders, and 2xlvl 2 Shammans and Grimgim Ironhide (relative to Grimgore Ironside and same stats, same figure. Just changed the name for the fluff.) The Orks put their spiders on the far flanks, Grimgore with the Black Orks, both shamans with the Savages. He put his artillery behing his lines. The orks player figured he had me outranged, which he did. So he sat back. This probably would have worked out for him if he had successfully blown up my Great Cannon and sank some rocks into my wizard bunker from his rock lobba. He did not do this however, instead he used his large artillery barrage to try and kill the Demigryphs in both first and second turns. This gave the Great cannon a chance to take off both doom divers right near the beginning of the battle. The empire battle line moved up slowly but stayed out of reach of any charges. As the artillery attack proved to be lacking lustre Grimjim ordered the ork line to move forward. Meanwhile on the Empire right flank the Spiders tried to cause problems for the Inner Circle Knights, they were having none of it so faked a charge on the spiders. 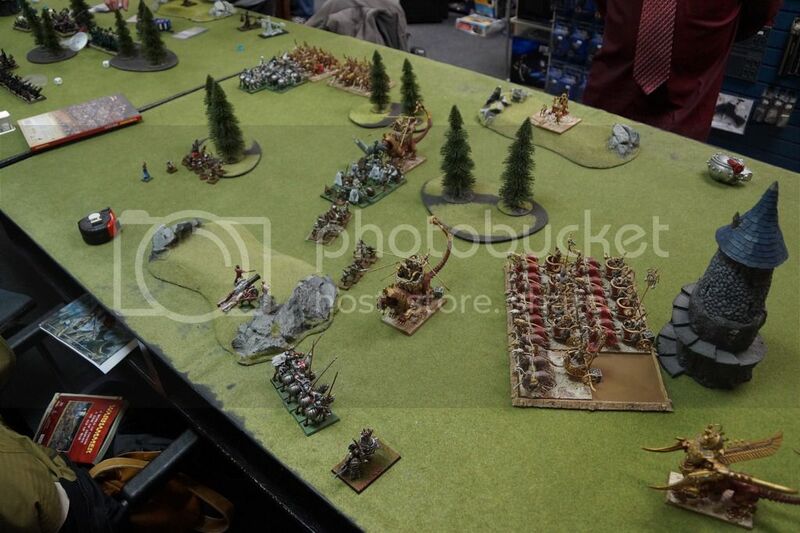 The spiders ran away and the right flank was open! The Inner Circle Knights made great speed and a very long charge slaughtering the rock lobba in turn 2.
the Inner Circle Knights came around the back of the battle cutting up the other rock lobba. The Savage orks took many casualties from the wizards banishing many of them and Great Cannon blasting them to bits. 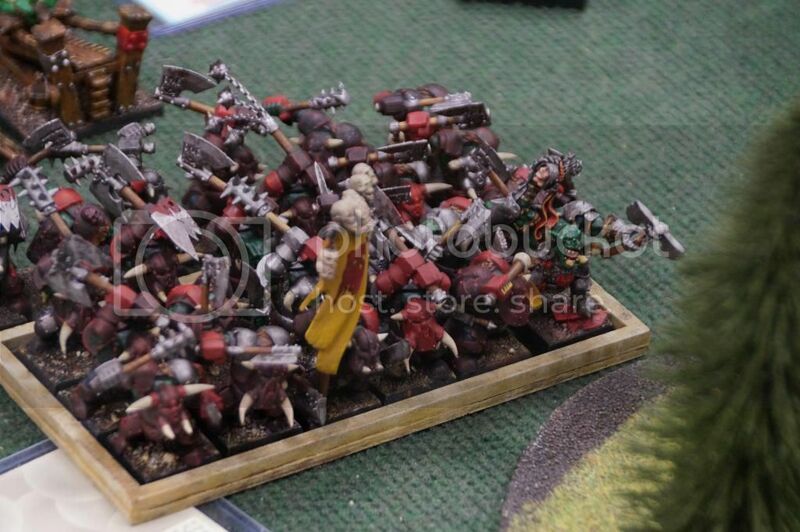 The ork line was struggling. A few times the leaders had to declare to charge before the masses would budge forward. This gave great time for the Empire line to become ready for the ensuing hand to hand combat. 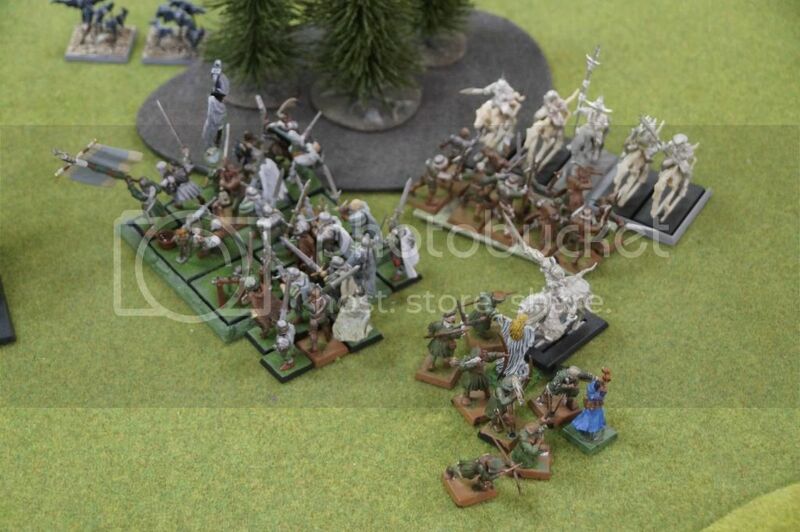 Just before the Orks made their final charge a brave company of FCM ran out to meet them. They died to the last man for their country, but it was not a waste. They bought just enough time to organize a counter charge against Grimjim. 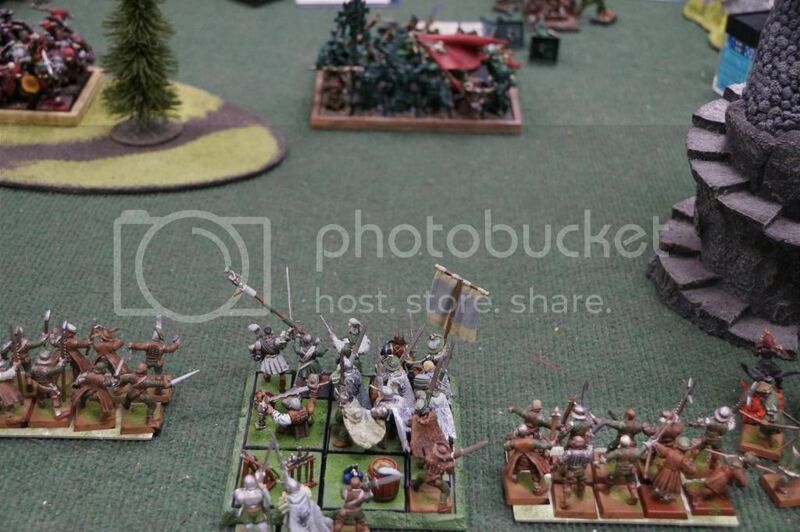 Brother Fullster led the charge and was joined by the Great swords and the Knights from his left flank. Together they smashed into the Black Orks. The charge was full of glory and light. Between the three units they killed more then half the black orks and scattered the rest. Grimjim fell that day, running as fast as he could from the hammer of Brother Fullster. Leena awoke to her father calling. It had all been a dream. A distant memory of battles long past. She was home in her bed. She couldn't stop dreaming of these old battles. Her body was hungry for adrenaline, hungry for a life changing circumstance. Soon would be the time to defend her homeland. The game ended in a significant win for the Empire. The Empire only lost 1 detachment of 10 FCM while the orks only had left the savages and 1 groups of 5 spiders. Looking back I made a few mistakes such as Fullster had VHS but didn't use it against Grimgore. Also the Shamans magicked my witch hunter to death and I totally forgot his MR2. Despite these things I actually think that I played well. Had a sound strategy and the dice rolls helped me out. Had a great game against a very nice opponent. Looking forward to the next battle I get to report! Good thing you remembered to take some pictures. So harsh Noble Kor. the dream state was to put the battle into context, it had happened before but was a battle while she was at the light colleges. 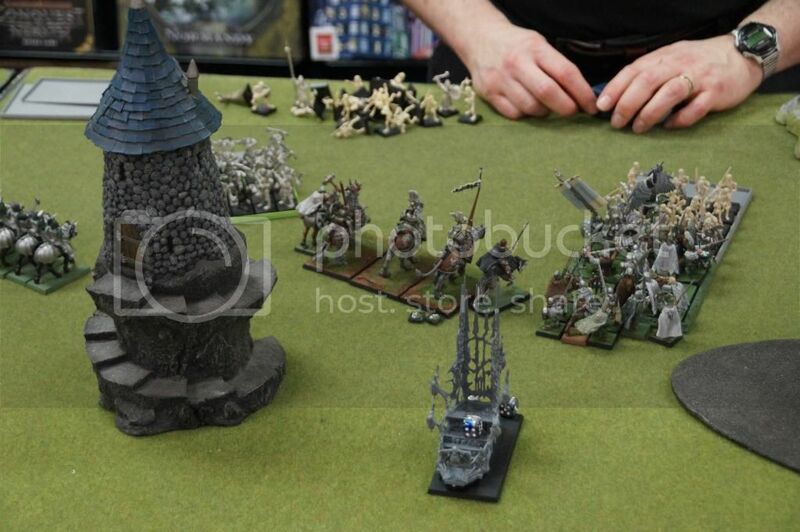 The problem was I couldn't figure how to have Leena Lunders at Ginglemoot fighting Orks? And I wanted to give some history to her without taking her out of the position she was in at Ginglemoot. I'm sorry, I know the "it was all a dream" is like the worst phrase in story telling. Also, the Orks player was pretty new. He's been playing at the club just a bit longer then I have(the club only plays once every 2 weeks). So I think his mistakes stemmed from this. His loss was a mixture of bad decisions and bad dice rolls when he needed it, such as the charges. Just as my victory was partly my strategy and partly my dice rolls when I needed it. I will be sure to give more detail next time, thanks for the feedback! Nice to see a game, and looking forward for more. @undivided.captial: My mistake. I take it where she is now, and where the battle was are quite far off...? Where's Ginglemoot anyway?! She's in the Moot near Sylvania! Cmon man gotta read the first post, I'm pretty proud of the background/story telling haha. When I'm checking this quickly at work I really don't have time to re-read most of the threads. Leena and the town of Gingle Moot had spent many days in a peaceful slumber after their first battle against the undead legion. They took time to lick their wounds and gain their strength again. The town had barely begun to recover when Van Fred appeared on the horizon. There was no way that the devastated and exhausted town could face this force alone. They had neither the numbers, the power or the training. As Leena was about to despair Brother Foster arrived at her shop door. "Leena!, we must stand and fight!" Leena knew he was right. They had no other option. If they didn't face this enemy now they would be facing it just down the road after it had been more powerful. It was either fight or die. "Foster, go find me some archers." Leena went to the garrison and mustered the Greatswords. Foster gathered small groups of townfolk into militia and archer detachments. They quickly realized this would not be enough, they needed more troops. Immediately they heard "clip, clop" up the dark cobblestone road. Over the ridge came a great host of Knights in shining armour and green and white feathers. There were even some demigryphs among them. This must be Marshall Ney, the Grand Master of the Knights of the Green Banner. Up marched Ney, "We have some to reinforce the boarder regions!" "And you have done it well, fall in with us. We march to meet a vicious enemy!." Answered Foster. Leena Lunders brought to the field Brother Foster the Warrior Priest and Marshall Ney the Grand Master. They brought 30 Greatswords with them and Marshall Ney brought 12 ICK, 5 Knights Orders, 3 DGK. The Engineers brought a cannon to the field and there were smaller detachments of Militia and Archers scrambling together. Van Fred brought to the field a host of 2 Neromancers and a lesser Vampire. He also brought a Terrorgieghst, hoards of bats, some skeletons, some ghouls and a large haunted machine. In the beginning of the game I did not deploy very well in the matchups. I found myself stumbling around the centre with the great swords later in the game. The idea was to demolish the left flank and then cross the board. To do this I wanted my ICK to distract Van Fred, the Ghieghst and the lesser vampire. I began by pushing hard on the left and keeping my ICK to protect my cannon on the right. The cannon did no damage and I tried to get Leena Lunders and the lvl 1 Light Mage into range to Bannish Van Fred. Foster and Ney carged up the left side of the field with the DGK. The skeletons stayed and made me come to them. The left Empire flank was slow and failed some crucial charges early on. Meanwhile on the right side of the field the Terrorgeist brought the cannon to it's knees. Turn 3 the Empire left flank made it into combat. This was later than expected but if combats were won it would not be disastrous. These combats did not pull through with great strength however. Also with some tricksy rules play Van Fred avoided some charges which could have been on a better day. The empire right flank became crushed under the great weight of Van Fred's power. The ICK managed to put 2 wounds on Van Fred but he sucked their blood and regained them. Leena Lunders was unable to successfully cast her spells. This allowed the lesser Vampire to charge into her and her archers. In turn 5 the game was pretty much over. Leena and her archers had been slaughtered. 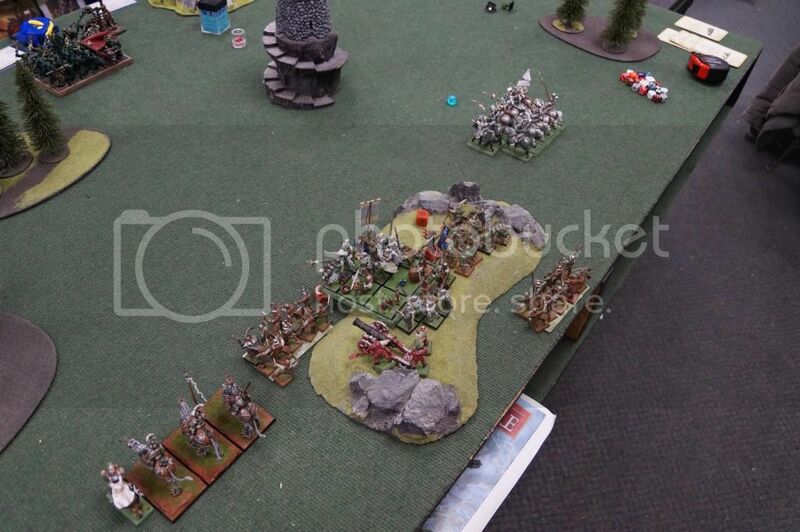 The necromancers on the Empire left had not been slain and Van Fred charged across the field to raise his fallen zombies. Foster and Ney fought on but were overwhelmed with numbers and the eminent danger of Van Fred. The Empire found their forces running in every direction to fight another day. This battle was a combination of inexperience and ignorance. I am a pretty new player so I don't question the rules as much as I should have in this game. The game ended in a severe loss to the Empire unfortunately. The inexperience I will have to get better at deploying my troops, this will make a huge difference! Also the strategy was flawed. In this army I need all my units to work together to pull out a win, I can't spread the board as I did. The ignorence was mostly not catching rules that my opponent was not following. This put me at a hug disadvantage. In conclusion, I was happy for the change to play and learn some new ways to move forward. I remember losing against a similar Vampire army, because of similar matters. 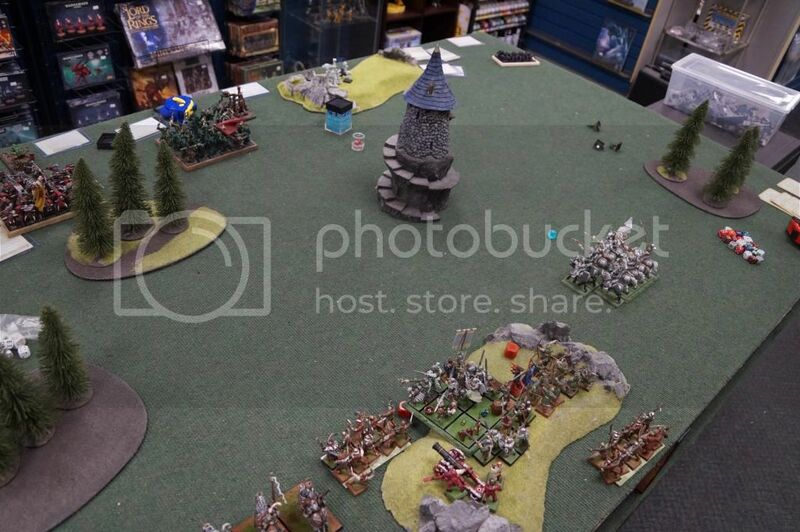 My opponent wasn't even an experienced WHF player, just a keen gamer with good understanding of rules and how they work together to bring up unique and unseen force concentrations on the table. And he played it simple, whereas I was spread thin, like I think you were. Things to learn. I love naarative reports, they remind me of the old White Dwarfs, where the magazine crew actually gave a toss about forging a great narration and making the game more interesting. I love this thing that you have here and will defintely follow this thread. And he played it simple, whereas I was spread thin, like I think you were. Things to learn. I think you have something good here Z. Thanks for the feedback! I really appreciate it. Leena and all that was left of the village moved along the road south as quickly as possible. Van Fred was close on their tail. The regroup had taken its toll on the surviving army and moral was at an all time low. They had to move quickly with little time to rest if they were going to make it to the safety of Stirland. Leena could only hope that her brother Bard would be there to help them in their moment of need. If he wouldn't the Ginglemoot and all of the Moot itself would be lost to Van Fred and whatever mutilated master that he served. The army headed north along the Stirland Road. It would only be a day to Schiebbs in the province of Stirland. Leena and Foster were in Marshall Ney's tent discussing the current position. The small group had to stop for the night's rest. They had no scout reports of Van Fred closing in, though they all knew the danger of resting at night-they had no other choice. "If we can make it through the night we can make it to Stirland" Foster was saying as Ney walked in. He was wet with rain. He took off his hat and put it on the stand. He took the time to slick back his dark hair and said, "If might prove easier said than done Brother. My scouts have not seen anything yet but we all know how little good scouts do against vampires at night." "Yet they are all still alive at this point so we may be free and clear no?" Answered Foster with more hope then sense. "No, I doubt that we are free and clear." Leena piped up. She was tired. they had now been traveling for a day and a half with no rations and little water. Hopefully this rain would actually raise spirits and if-only if- they could make it through the night the people of Ginglemoot could make it to Stirland. "I am going to bed. Goodnight gentlemen, raise me if anything appears out of the darkness." Leena woke. From where she was laying on her back she could see sunlight dancing on the tent. She didn't think about war, death or undeath. She thought of camping with Bard when they were young children. Listening to the birds and watching the sun shine down. She then noticed there were no bird noises, only the normal noises of camp around her. She got out of her tent and found a myriad of men packing up camp to travel. They must have lasted to night! A horn blew in the distance, what could this be? Surly Van Fred would not leave them at peace in the night only to attack during the day? Leena couldn't sit and wonder.. it was time for action. She hurried to Ney's tent. The heat of this sun was relentless. When they finally drew battle lines she saw the devil's in the face. It was a new, different type of undead. She had never seen this kind of Legion before in this part of the world. These were dressed in Royal garb, they brought large beasts and vast chariots to the field of battle. These fought in the day. 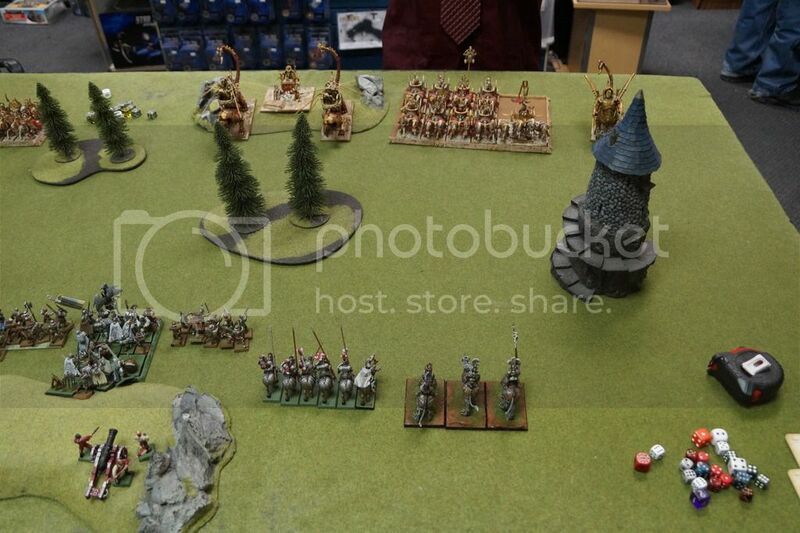 6 Charriots led by Settra the Imperishable with BSB and other Hero forget what it was? 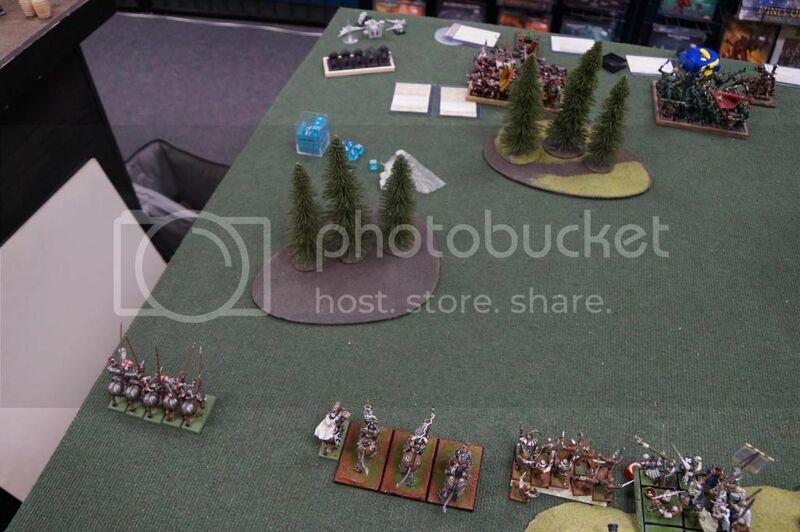 My Opponent placed his forces with the strong chariot unit on my right flank. This heavily chose this flank to be the obvious push forward. 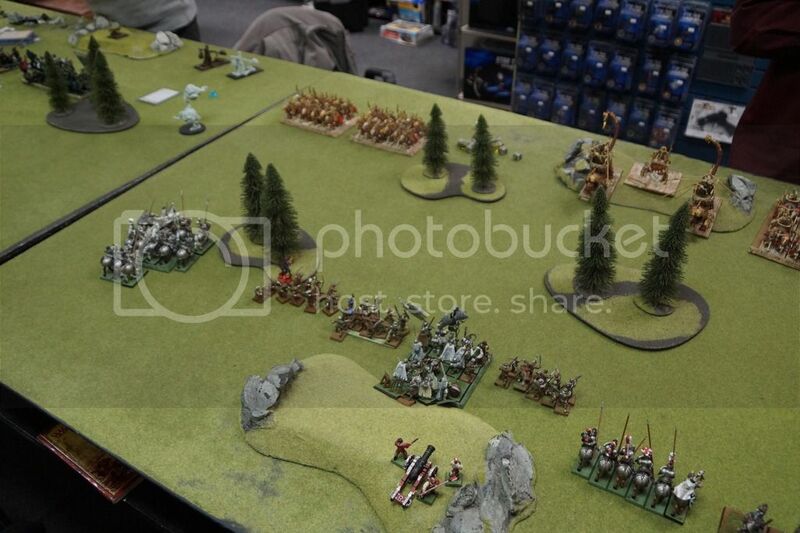 then the Sphinxes in the middle to take on my infantry and then the Skele Horsemen on the far left. I chose to try and push hard on my left flank and try to clean that side before sweeping over. I also wanted Leena far away from the Chariots but close to the Great Swords to buff and or banish those Sphinxes. 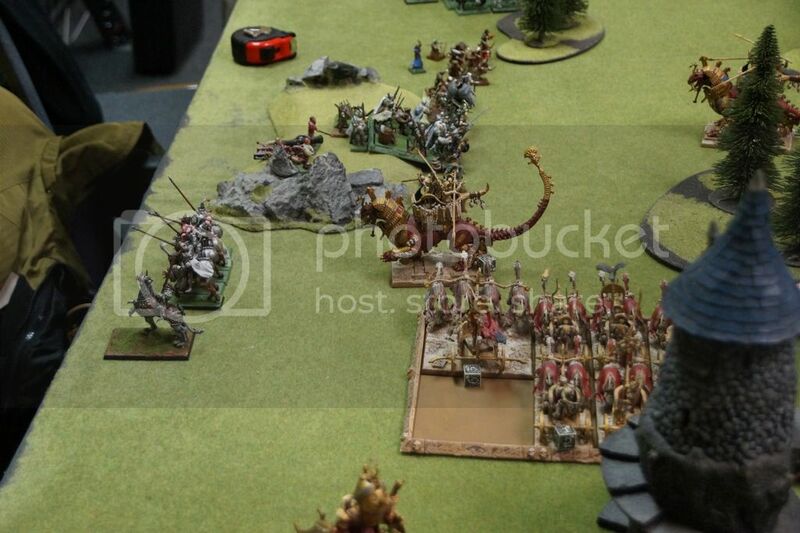 In the beginning of the battle Ney on the left flank had a hard time measuring up his foes. 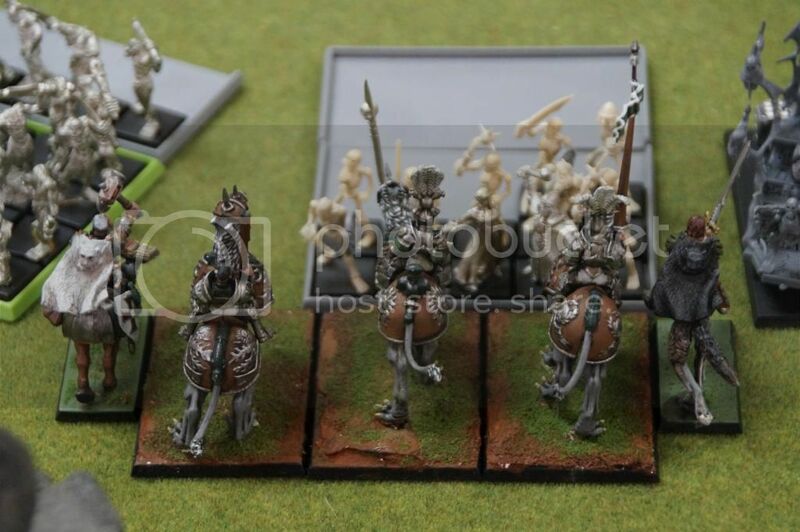 He couldn't quite tell how strong these Skeleton riders were and was cautious of charging in his Knights. This was unfortunate because on the right Settra held no reservation in smashing into Brother Foster and the Demigryphs as well as the knights. 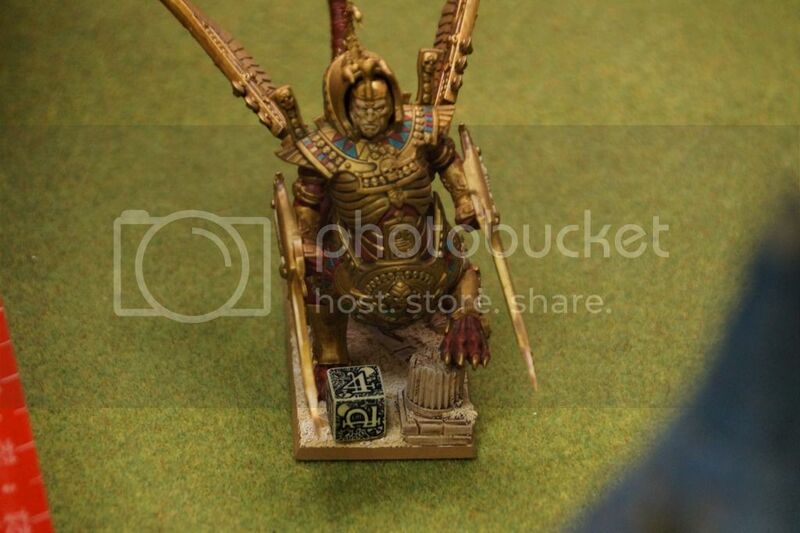 The first Sphinx did not waste any time in colliding with the Knights either. Ney knew he needed to move faster but did not want to move foolishly. Luckely the Cannon and Leena kept the Sphinxes hiding in the early battle. The midline faltered. They neither wanted to charge the Sphinx or wanted to take the full brunt of the monster either so they took a few steps back. 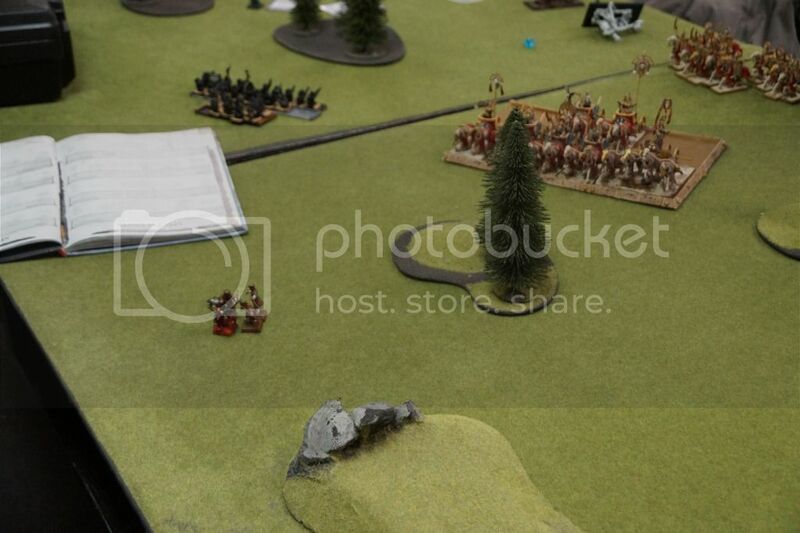 Settra crashed through the right flank with Brother Foster. The right flank began to flee but Foster brought them back under control before they left the field of battle. The the Captain with the Greatswords ordered the charge and fiercely they charged towards their target. The Sphinx would have to work hard to defeat these men of strength! Marshall Ney on the left flank also charged forward into the Skele Riders! The charge of the Knights of the Green Flame was glorious. The battle looked to be heating up. Leena looked around the field and saw there might be a chance of great victory! The battle looked like it may swing in the direction of the empire when Ney smashed the skele riders and turned to face the field. There were many more monsters to face however. As the battle got hotter the folk of Ginglemoot began to fall apart. First were the Great Swords who fled the battle even with the encouragement of their Battle Standard Bearer. Next the Knights were killed after Brother Foster was struck down by the Sphinx. The Demigryph Knights broke and ran. Leena ran for the woods. The peasant archers followed her. She knew that the trees may help in fending of Settra from fighting her face to face. It was her last chance, her only hope. Settra and his chariots bashed through the lines of militia and headed towards the empire left flank where Ney and Leena still had the breath of life. He had strict orders to finish this lot. Leena saw across the battle field a large Sphinx fall the a cannon ball and saw Ney finish of the last Skeleton Horserider. This would be it. She would receive the charge and Ney could come in from the flank on the Chariots. Settra was too skilled of a general to take the bait. He sent his Chariots hurling towards Ney and left Ney and most of his units laying on the ground in pools o blood. The rest of the Knights turned and ran for their life. Leena knew she had no choice but run. So run she did. She ran through the forest where she knew the chariots wouldn't dare travel. She made a quick dash to the left and Banished the last sphinx into the Abyss. Settra closed in and loosed a volley of arrows. Most of the archers around her fell but Leena still ran on. Finally she was sure that she left Settra far behind. But she was now alone. I have to say this was a very fun game. My opponent was awesome to play with, very veteran player playing a very fluffy list. 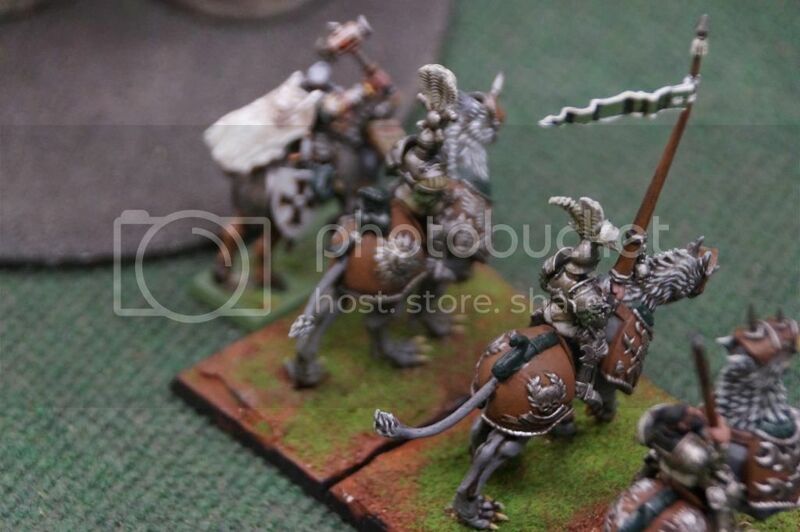 And of coarse his models were so beautifully painted it made it even better. So I probably made a huge mistake in trying to out think my opponent's plan. I should just take it simply and play to my strengths. Moving forward I am going to try and focusing on 1 playing tighter, 2 making sure my match ups make sense. I really do think I could have come out on top here but a few mistakes did me in this time. Again a really fun game! I really love those bat reps? More pls.